Mulligan's mock Mass takes even more literally than does the Catholic church itself the mystery of transubstantiation at the heart of the ceremony. Encountering "A little trouble about those white corpuscles," he asks the "old chap" upstairs to inject some more electricity into his magical cup, and announces that this extra quantum of energy has done the trick: "That will do nicely. Switch off the current, will you?" 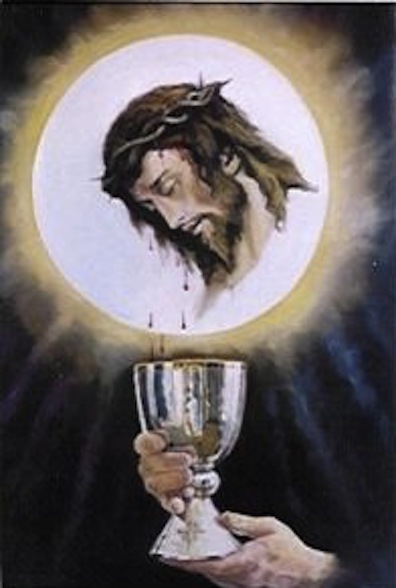 As Mulligan holds aloft the chalice containing (or about to contain) God's blood, he acknowledges that some of the flecks of shaving foam are experiencing difficulty in their effort to become “white corpuscles,” the antigen-destroying part of the holy substance. Blood is not simply red stuff, but a compound of parts that exercise discrete functions. When medical students discuss miracles, they like to get their facts straight. And if transubstantiation means converting one form of matter into another, then according to modern physics some energy must have been introduced into the system. 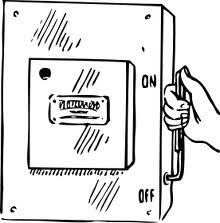 The Almighty presumably assists his ministers by tapping some power source such as electrical "current." The wafer and the wine. Source: ufocon.blogspot.com.